The Netherlands are well known as an export country. Our fruit trees and plants are suitable for sale in the Netherlands as well as beyond. More and more foreign buyers are finding the Netherlands also for fruit trees and plants. The quality of our plants and our dedication combined with the knowledge of the market, makes the Fruithof a reliable partner for all export trade. 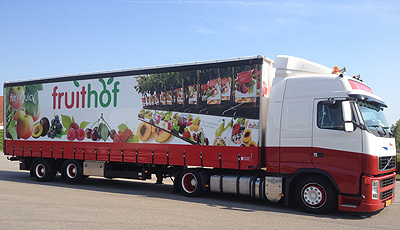 As a result, our products are not only found in countries such as Belgium, Germany, England and France, but for example also including Sweden, Denmark, Spain, Italy, Switzerland and Austria are now equipped with our wonderful fruit concept. Whether it is direct or via FloraHolland, the Fruithof supplies through good logistics planning and act quickly the products timely and fresh on the location of your wishes.